Der von Bill Hough für ihn entwickelte und gebaute CM Booster klingt brilliant, ist hochdynamisch, extrem vielseitig und liefert den klassischen Hardrock Tone der Deep Purple Mk.II Ära. Er kann aber auch Humbucker Usern empfohlen werden, die ihren Sound heller und knuspriger haben wollen, da er als Low Gain Booster sehr gut zu Humbuckern passt. Sein Bright Regler bietet enorm viele Möglichkeiten, was die Höhen und Gain betrifft. Der Mode Regler liefert die spezifischen Charakteristika des Hornby Skewes Boosters mit Germanium Transistor, mit Silikon Transistor und natürlich des zugrundeliegenden CM Modells von Bill Hough. Hier lohnt sich der Einstieg mit einem Standard Setting: Bright auf 8 Uhr, Mode auf 2 Uhr, bspw. im Normal Kanal eines AC30 - nicht im Brilliant Kanal. Hat man den Charakter des CM so kennengelernt, ist weiteres experimentieren dringend anzuraten und lohneswert! From 1971 forward, Ritchie Blackmore not only used the mid-rangy sounding Hornby-Skewes trebleboosters, he also used the highly dynamical and brilliant sounding CM booster, built and designed by Bill Hough. The new BSM 71/73 CM is a faithful recreation of this pedal plus the typical BSM add-ons. This is all you need to cover the whole tonal range of the legendary Deep Purple Mk2 period. The "Mode" and "Bright" controls make this low-gain stompbox extremely versatile, producing a classical Hardrock tone with a lot of nuances. Not only useful for Blackmore-sounds this is a pedal that also works well with humbucking pickups, giving you a crisp yet dirty crunch sound on an already overdriven tube amp. You will even get a super-clean funky tone with single coils and a clean amp. You will probably never want to switch off this pedal anymore. Setting advice for BSM 71/73 CM Booster: Standard setting for the 71/73 CM bases on the 1971 CM (custom made) booster built for Ritchie by Bill Hugh and should be used in front of a normal amp without an additional bright-enhancement circuit: "Bright" at 8:00 o'clock, "Mode" at 02:00 The "Bright"-control of the booster works similar to the bright volume of an amp. For technical reason the direction of the controller works contrary to the common direction counter clockwise. This means, that the noticeable full gain-setting without bright-enhancement is at minimum 7:00 o'clock (full left). Maximum treble (or better maximum bass-mid-reduction) can be achieved by turning it up full at 17:00 o'clock. At 9:00 the booster works with a little reduced gain and barely noticeable treble-lift, thus can be defined as neutral. In between 7:00 and 9:00 the gain-range can be described as sound-neutral. For Ritchie's airy sound around 1971 and 73 it is not necessary to use full gain. 9:00 is good standard setting to start with. The "Mode"-control provides the specific frequency-range of the basic-booster model what is the CM-booster by Bill Hough, generating Ritchie's 71 Beat Club sound. 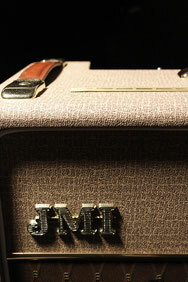 Around 1973 Ritchie additionally started to use his new Marshall Majors with the bright-volume-characteristic. Therefore to generate his 73NY-sound it is necessary to turn the Bright-control to about 13:30. Fine-tuning around this point belongs to your personal taste and equipment. By turning the Mode-control less or equal 12:00 and Bright to about 8:00 means entering the area of the old Hornby-Skewes-boosters. 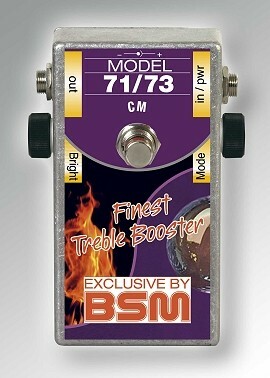 To emulate the germanium fitted HS-C booster you will have to turn Mode to 12:00, Bright 8:00. The silicon powered HS-S can be achieved by turning the Mode fully back to 7:00. In most cases it will be useful to give a full gain setting on the bright-control. Just to remember: the pot works counter clockwise, therefore the position is 7:00 To achieve a nice power-boost set Bright to full gain at 7:00 and Mode to 12:30 to 13:30. This way low gain single coils can sound like the fatter Quarterpounds. If the sound should be most biting, Mode needs to be at least 15:00. Ratio between treble and bass can now be balanced via the Bright-pot. This should be set greater than 9:00 to have a tight and clear bass, not to overlie the brilliant treble. The higher the Bright-control-setting, the cleaner and slender the bass will be.